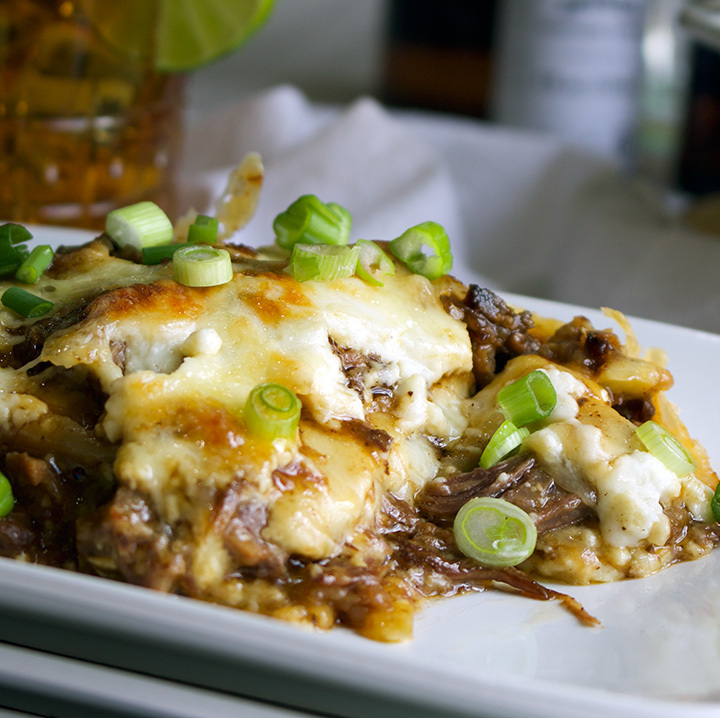 Slow Cooker Short Rib Lasagna with Béchamel Sauce. 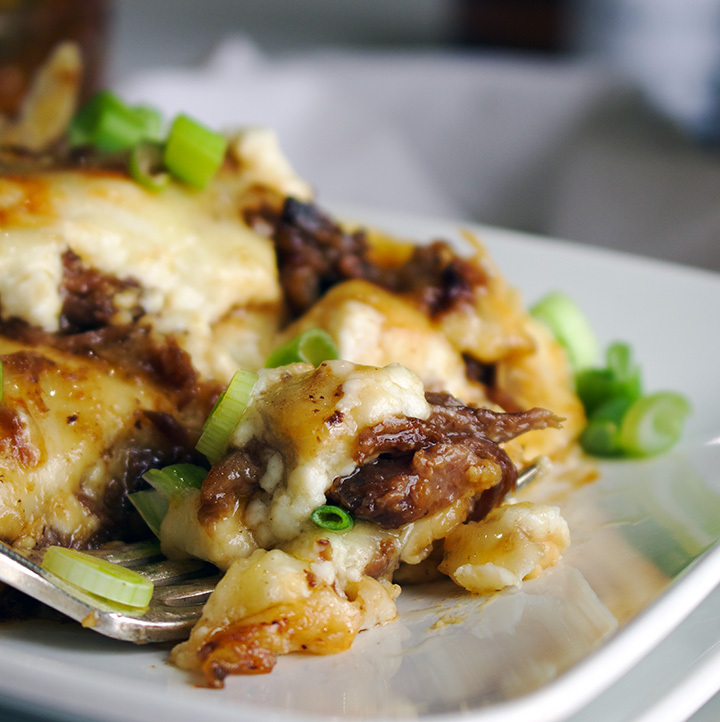 Chunks of fall-apart tender slow cooker short ribs are layered between wonton wrappers, white cheddar cheese, and creamy béchamel sauce. THIS is the essence of comfort food. 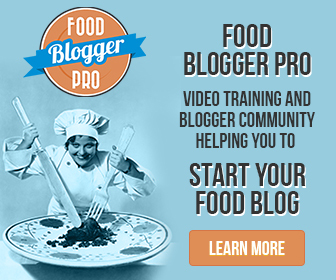 When I first started food blogging, I realized that I had a decision to make when it came to writing recipes: provide a lot of instructions and run the risk of readers assuming that because the instructions are long the recipe is difficult and complicated, OR write shorter instructions and assume every reader has enough experience in the kitchen to fill in the gaps. If you’ve been following me for any length of time, here or on my baking blog, you know which side of the argument I chose – long, detailed instructions. Over the years I’ve received messages from readers that they appreciate the level of detail. 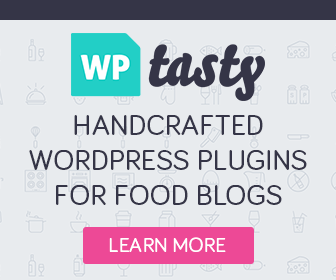 And yet, when I publish a recipe like this one, I worry. Will you, dear reader, glance over the lengthly instruction and assume that making this lasagna will require you to spend all day in the kitchen? And will that turn you off from making it? Oh, how I hope not. Because this dish is not only one of the most comfortingly delicious foods I’ve ever made (or eaten), it’s really quite simple – mostly, because the short ribs are cooked a slow cooker. And, slow cookers and short ribs were made for each other. Slow Cooker Short Ribs are the bomb. 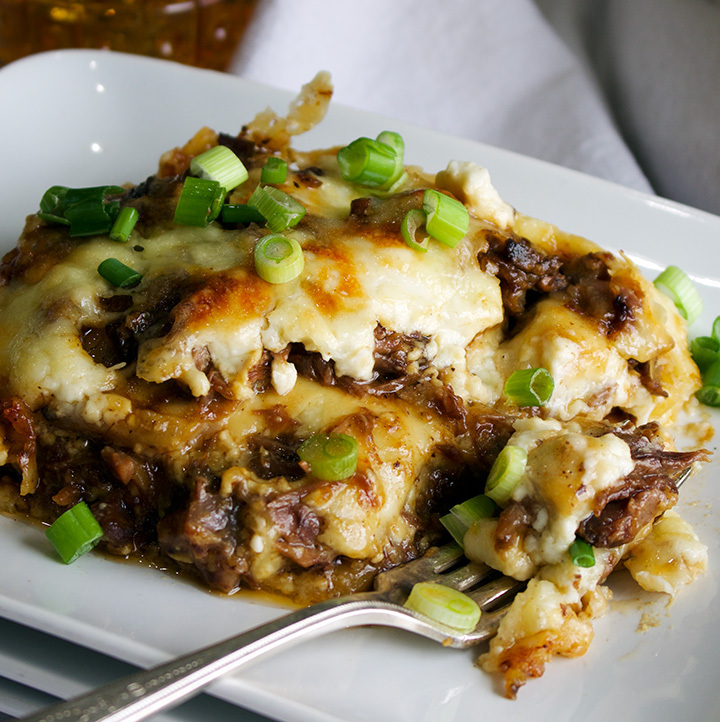 If you hope to be eating short rib lasagna for dinner tonight, you DO need to put those short ribs in the slow cooker in the morning. But, you don’t actually have to do anything while they cook. 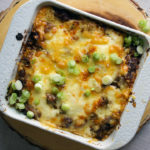 They will simmer away in your slow cooker, getting all meltingly tender and delicious and making the whole house smell so good you might need to leave for a bit to stop yourself from eating all the meat before you even have a chance to turn it into lasagna. 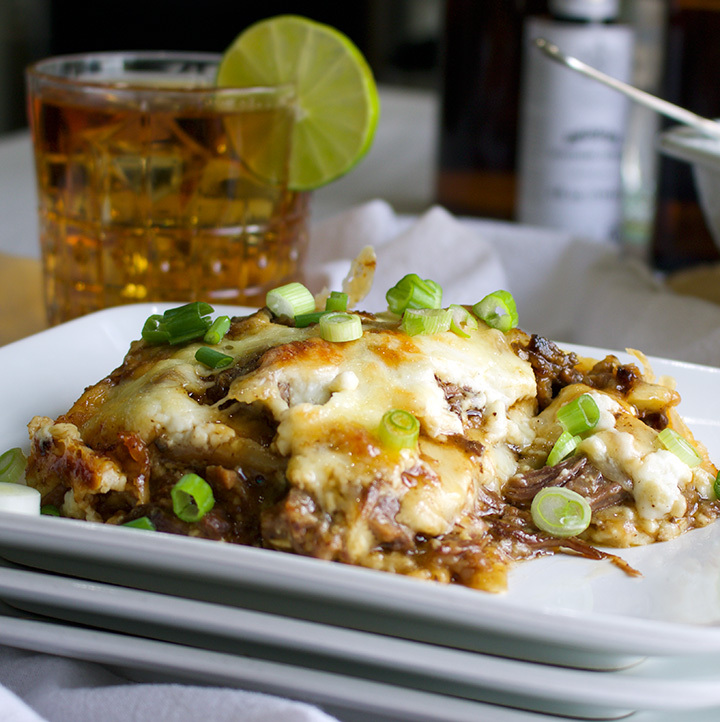 After the short ribs are done, it’s simply a matter of cooking down the cooking liquid into a rich sauce, shredding the meat, making a Béchamel sauce (which is nothing more than milk thickened with flour), and layering it up with some wonton wrapper and cheese in a baking dish. Even better – make the short ribs a day or two in advance, storing the meat and cooking liquid in your refrigerator until you’re ready to make your lasagna. This makes skimming the excess fat from the cooking liquid much easier because it will naturally harden over the top of the sauce. The only downside – and it’s a big one – is that you will have to restrain yourself (and everyone else in your home) from eating the meat. This is really, really difficult. I speak from personal experience here. 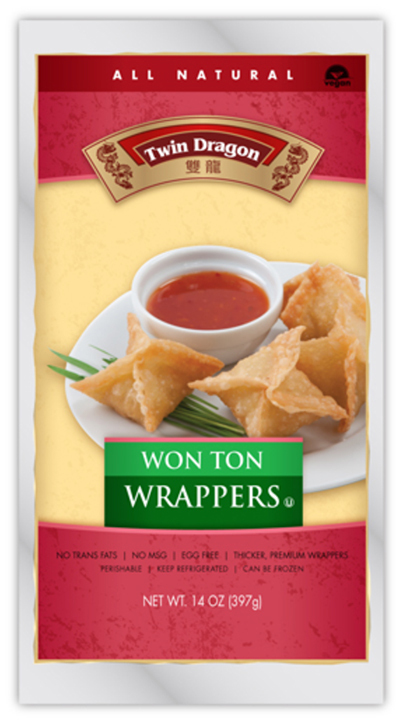 A note about using wonton wrappers instead of pasta. This entire recipe is the result of my entering a recipe contest sponsored by JSL Foods, the maker of Twin Dragon Wonton Wrappers. Let me tell you, while I’d (obviously) love to win the contest, it’s all worth it because using wonton wrappers instead of pasta to make lasagna is a revelation to me. I don’t know why I’ve never done it before. They are delicious in there. As the recipe advises, I like to layer them up, using 8 wonton wrappers per layer, even though 4 is enough to create a layer that stretches to all sides of the pan. Doubling the layer of wonton wrappers just adds more structure to the lasagna, making it easier to dish out and standing up better to the rich layers of meat and cheese. Add the cornstarch and about 1/2 cup of the cooking liquid to a bowl and stir to combine. Add the rest of the cooking liquid to a heavy bottom saucepan. Slowly whisk the cornstarch mixture into the sauce in the saucepan. Bring the sauce to a boil over medium high heat. Reduce the heat to medium, and let simmer, stirring frequently, for about 15 minutes until the sauce is thick. Combine the shredded short rib meat with the sauce, stirring to coat the meat in the sauce. To make the béchamel sauce, add milk and the bay leaves to a saucepan and cook over medium just until just under a simmer; small bubbles will appear around the sides of the saucepan. Turn the heat down to low and keep warm. Add the butter to a heavy bottom saucepan and set it over medium heat to melt. When melted, add the flour and cook, stirring constantly and vigorously until the flour is a very light brown. Remove the pan from the heat and very gradually, add the milk, whisking constantly to prevent lumps from forming. Put the saucepan back over medium heat and bring to a boil, stirring constantly. Turn the heat down to medium-low and cook for 10 minutes longer, stirring constantly. Remove from the heat and stir in salt and pepper. Taste and add more if you like. 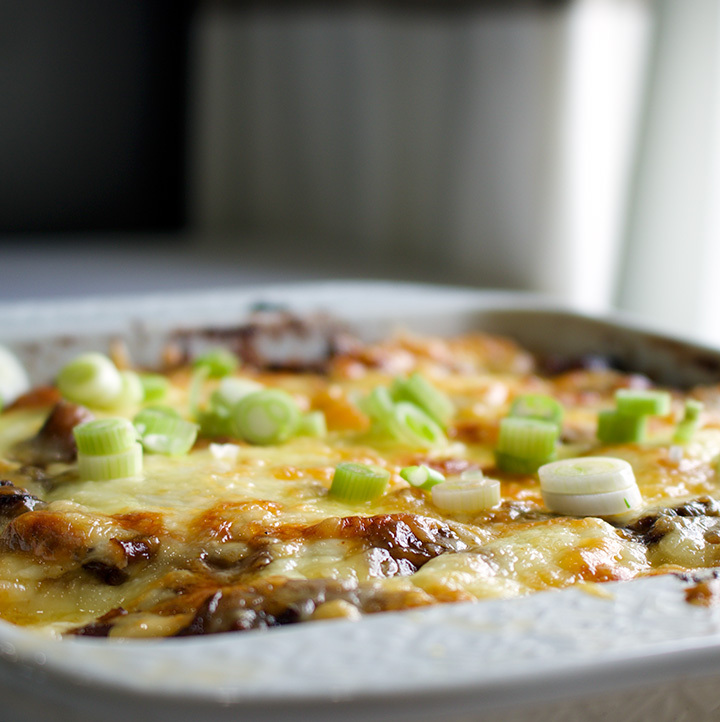 In an 8 or 9-inch square baking dish, spread about 2 tablespoons of béchamel sauce over the bottom of the pan. Layer 8 wonton wrappers over the sauce, covering it completely. Spread 1/3 of short rib meat and sauce over the wonton wrappers. Sprinkle with 1/3 of the cheese. Pour about 1/3 of the remaining béchamel sauce over the cheese, spreading it out slightly with a spatula or the back of a spoon. Layer another 8 wonton wrappers over the béchamel sauce, following with another 1/3 of the meat and 1/3 of the cheese. Repeat layers one more time using the remaining béchamel sauce, wonton wrappers, meat, and cheese. Place the lasagna in the oven and bake for 30-40 minutes, until the sauce is bubbling all around the edges of the pan. If the cheese starts to get too brown, cover loosely with a sheet of aluminum foil that you’ve sprayed lightly with non-stick baking spray. Remove from the oven and let stand for 10 minutes. Sprinkle the top with scallions and serve.